Turn your goods into gold on the worlds #1 online retail site. .
Amazon makes it easy for customers to find and purchase exactly what they want quickly and securely. 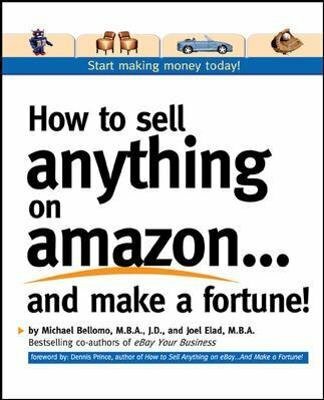 "How to Sell Anything on AmazonAnd Make a Fortune!" makes it easy for you to sell your merchandise to millions of buyers all over the world. Whether you want to start your own online business or extend a retail business, youll learn, step-by-step, how to set up shop on Amazon--and start making money--right away. . .
Get expert advice on determining what to sell and how to categorize your products. Find out how to sell items on Amazon Marketplace, become a Pro Merchant, set up Paid Placements, use Amazon Auctions, establish an Amazon zShop, and more. Start selling on Amazon today and include your products among Earths Greatest Selection. . . Discover the selling secrets of Amazon. . Develop listing and pricing strategies to beat the competition. List and sell items on Amazon Marketplace easily. Use Amazon Auctions to get the best prices for special items. Establish your own virtual storefrontan Amazon zShop. Promote your products by becoming an Amazon Expert. Use Paid Placements for maximum exposure. Develop targeted email marketing campaigns. Become an Amazon Pro Merchant. Distribute your own intellectual property through Amazon worldwide. Sell worldwide through Amazons international sites. .